The Cold War lasted for years. The Blue Faction and the Red Faction were delicately balanced and evenly matched against one another; each constantly maneuvering in the shadows but unready to make the first move. That changed this morning. A minor skirmish in a remote location has grown to engulf the world. The peace has broken and your opponent has launched their master campaign! As Spymaster, you know this will be a game of wits and of brawn, matching all of your forces against theirs, with the world’s future hanging in the balance. Failure is not an option. In 1955: The War of Espionage, you are the head of one of the two major Faction’s Covert Operations Agency. Your task is to protect your country from the tainted views of your enemies while seeking to gain the trust and support of the world’s population.To do that, you will be utilizing resources provided to you by your supporters (represented by the cards you draw). 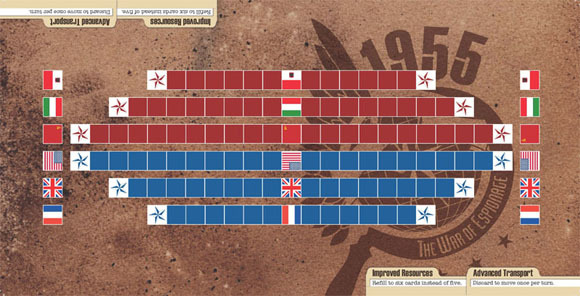 Every successful operation in a country gains you some level of temporary influence until such time as you secure the country’s stability (represented by advancing the Control Marker to your side of the board) as they support your faction. 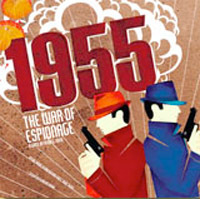 Add a Review for "1955: The War of Espionage"